An exclusive Recognition Ceremony to acknowledge recipients of the 2018 Eagle Class. A portion of our program will also include an opportunity to connect with a mentor. When registering, please take a moment to share with us what career field interests you. Reception at 2:00 p.m. followed for a program at 3:00 p.m.
Congratulations are in order for our new Eagle Scouts! View our 2018 Eagle Scout Class list now. Join us for the Grand Re-Opening at the Charles & Lorraine Vignieri Scout Service Center. The store is completely remodeled and we are excited to share it with you! Saturday, May 18, 2019 from 9:00 a.m. - 12:00 p.m.
Vignieri Family Ribbon Cutting at 10:00 a.m.
Summer Camp Registration - Now Open! We are excited for you to join us this year! The outdoor program is one of the most appealing features of Scouting and is a great experience for Scouts and adults alike! Come along and enjoy swimming, archery, crafts and so much more! Check out the registration webpage. Don't forget May 1 is the deadline for the Early Bird fees. The Cub Scout Camp Webinar is available in case you missed it. This webinar reviews each of the council's camp options for the summer. We hope your Pack will join us at camp this summer! We are looking for Scouts ages 14-15 to come and experience our C.I.T program! Your Scouts will learn valuable leadership skills while being on camp staff and lead young Cub Scouts through their daily program. During the first week, the CIT’s will rotate between Scoutcraft, Eco-Con, and the Waterfront to determine what area they like the best. The second week they will get to experience the whole program in the area of their choosing. We will provide room and board and all necessary training during those 2 weeks. If you are interested, please email Katie Schneider and she will email you the correct application. Theme for this year is "Sailing the Seven "C"s"
On To Eagle is a council wide crossover camporee which allows Bears - AOL youth to spend the weekend with a host Scouts BSA unit learning different scouting skills while having a lot of FUN! Character Camp - Volunteers Needed! The 2019 Character Camp is coming soon and needs eager volunteers to join us! Every May, the Learning for Life character education program hosts its Character Camp at Indian Mound Scout Reservation, which is a pivotal point in the character development of our children. Learning for Life grade groups receive a one-day camp experience, serving as an exciting culmination from the LFL school year. We are seeking volunteers to help us with Field Sports, Team-building Activities, Craft Activities, Kitchen (staff lunch prep), Health Officer for the day, Camp Tours or Ship STEM. Join us May 31 - June 2, 2019 at the Milwaukee County Zoo for a unique experience as we showcase Scouting to the public of Southeastern Wisconsin! At Scouting the Zoo, Cub Scouts can have fun competing in events specific to their age. Tiger Cub-annapolis Race: building on the Lion Scout elective adventure, scouts can race their cardboard box. Design specifications and rules are in the event guides. Walk up competitors welcome from 9:00 a.m. until 11:00 a.m. and 12:30 p.m. until 2:45 p.m.
Pinewood Derby Race: If your Cub Scouts build a car and want to race, they are welcome to in the exhibition division at 12:30 p.m. If your Cub Scout ranked in the top 3 for your Pack, they can race in the championship division at 2:30 p.m. Both race registrations open at 9:00 a.m. and close at 11:00 a.m. Car specifications and rules are in the event guides. Baseball season is just around the corner! 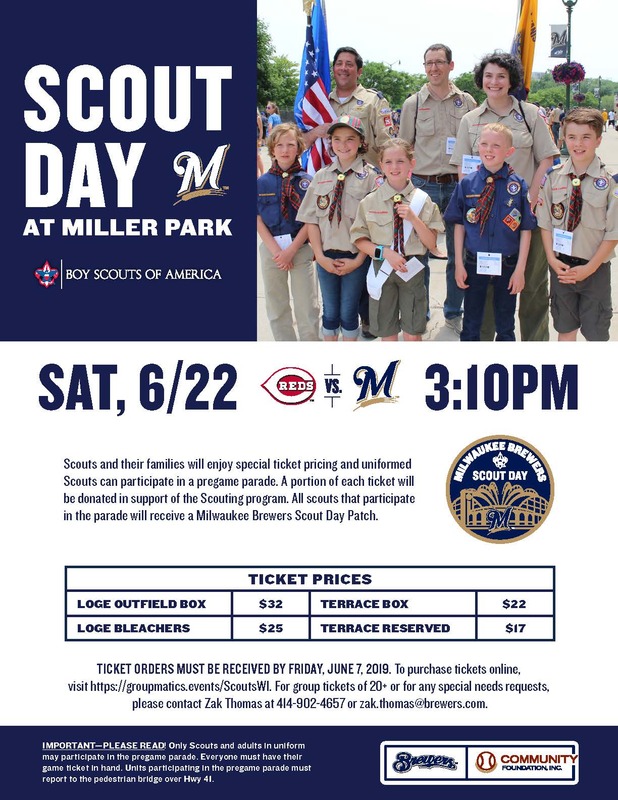 Join us for Scout Day at Miller Park on Saturday, June 22 as the Brewers host the Cincinnati Reds. First pitch is at 3:10 p.m.
Powder Horn Course - Register Now! Powder Horn is a high-adventure resource management course designed to introduce Scouting's adult leaders to exciting program possibilities that expose them to a wide range of fun and challenging outdoor/high adventure activities. Join us Tuesday, July 30, 2019 for a full day of excitement! Players of all skill levels are invited to take part in some friendly competition. Learning for Life is experiencing a “Volunteer Explosion” and we would like you to be a part of it! Camp Ammon is open to boys and girls who are at least 13 years old and registered as a Scouts BSA, Venturer or Explorer. Camp attendees come from all across the state of Wisconsin and beyond. Applications are accepted on a first come, first serve basis. We will send you a confirmation letter upon acceptance of your application. Campership forms for Scouts attending camp this summer are due on April 1.